I am in Barcelona for two natural wine fairs (Vins Nus and Vella Terra). 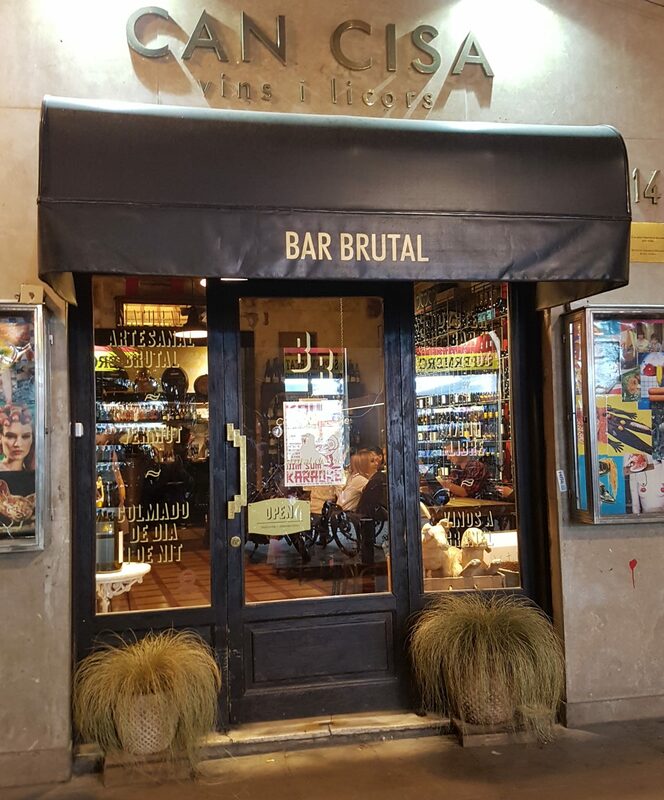 And I have just finished a well-prepared meal at the city’s perhaps most iconic natural wine bar Brutal. And what could be more appropriate than to have one of Joan Ramón Escoda’s wines as this week’s pick? Joan Ramón is one of the owners, and he was the one who brought my attention to this fabulous bar a few years ago, though he has no active role in it. Small plates like tuna tataki and ‘sweetbreads’ (here: pig’s cheeks) and cecina de vaca, lightly smoked ham from cow, were accompanied by several wines: An inspiring, fresh, yellow, barrel-aged xarel.lo Essencial 2017 (J. Rubió) from Penedès, Qvevri, a full thick, earthy, sauvignon blanc from Loire, with some residual sugar (made by a distributor of Georgian wines in France), a terret-dominated blend called Rouge fruit 16/ Rouge de Causse 15 (Petit Gimios), a dark, green herb-scented Minervois. To round off it all I had the floral, yellow and rosa-hued Súpertock Ancestral (Bodegas Cueva), a fresh valencian pét nat from the tardana grape. But in-between: A timely reunion with the following wine. The owners have grown their grapes organically in the Conca de Barberà since 1996, biodynamic since 2003 and without additions of sulphur (or anything else) since the 2007 harvest. This wine is made from the varieties cabernet franc, cariñena, garnacha tinta and merlot. It stays 10 months on the lees in inox, and clocks in at a relatively low 13% alcohol. Dark red. Cherry and blackberry aromas, with flowers and a mineral touch. Lively in the mouth, with a fresh acidity. The Real Wine fair is a two days event with focus on naturally made wine, where many of the leading producers in the genre come from all corners of the world to gather in London, this year at the Tobacco Dock in the eastern part of the city. The activities are not restricted to these two days either, as the arrangers (most importantly importer/distributor Les Caves de Pyrène) have collaborators all over the UK with their own arrangements in the weeks and even months leading up to the fair itself. This is a very nice place to be, with so many nice people (both producers and visitors) contributing to the atmosphere. And about the wines, I say ‘natural wines’ for short. But there are so many different interpretations of the theme, and add to this the variations in terroirs, grapes and producer personalities, so there are not two identical wines here. There were maybe not that many sparkling wines on show, but it struck me that here were some of the leading producers of naturally made sparklers in many categories. So here are a few. Let’s begin in Champagne. Pierre Gerbais is located in the Côte des Bars area in southern Champagne, and has been certified since 1996. Their vineyard consists mainly of the dark marl called kimmeridge. They use the most traditional grapes of the region, but they are also noted for making the first 100% pinot blanc called L’Originale. From the fresh Cuvée Réserve (24 months on lees) I tasted my way through the five champagnes they had on offer. Among the more special treats were the aforementioned L’Originale (officially NV, but from 2011 grapes): 100% pinot blanc, mostly from a vineyard planted in 1904, in white clay soils: A concentrated wine with aromas of yellow apples, some toast, salty minerals and it’s drying off. L’Osmose Extra Brut (also white clay, also from the 2011 harvest) made from chardonnay: Light colour, quite complex, with apple, some nuts, a nice acidity, and a dry aftertaste. In contrast, L’Audace (2011) is from pinot noir and from darker soil. Here is no dosage, no sulphur added. It’s darker yellow than the others, apples, strawberry, toast, and a mineral finish. Finally the Grains de Celles Extra Brut, made from 50% pinot noir and the rest chardonnay and pinot blanc and with 36 months ageing on lees, is the most complex of lot. More toasted, aged notes, but some freshness too, yellow apples, mineral, with a slightly sweet fruit balanced by its concentration. Antoni “Ton” Mata Casanovas now leads Recaredo together with his cousins Josep, Carles and Jordi. If there is one emblematic cava producer it is this one, second to no sparkling wine producer from anywhere. They practise dry farming with biodynamic principles, and only work their own vineyards high up in the Alt Penedès. I have visited them in Sant Sadurní (Catalunya) and tasted through the whole range. Here most cavas were represented. All their wines have a great concentration of flavours, from low yields and prolonged ageing on lees. They don’t have any dosage, and all of them long exceeds the ageing requirements for a gran reserva. They have more focus on the xarel.lo grape than most cava producers. This is the grape that shines most brightly of the cava grapes given a few years of ageing. Terrers Brut Nature Gran Reserva 2010 has slightly more macabeu than xarel.lo: Aroma of mature apples and a touch of apricot and peach, some balsamic notes and some toast too, and a fresh appearance in spite of the ageing. The Finca Serral del Vell Brut de Brut 2007 is made from approximately even shares of xarel.lo and macabeu. The colour is light, it’s complex, with fresh pineapples aromas along with some toast, some balsamic, and a surprising freshness after 8 years on the lees; the aftertaste shows a stony minerality. According to Ton this is because of the calcareous soil on top of the hill. Further down the same road is the Reserva Particular 2005 (also a gran reserva despite the name), that can be considered one of the purest expressions of Mediterranean sparkling terroir wine (even if Recaredo themselves makes another fantastic cava only in some years), with a xarel.lo 55%/ macabeu 45% blend: Dark straw colour, some lime, smoke, concentrated, rich, and remarkably fresh for its age (almost 10 years on yeast). Worth noting is also that their Brut Intens Rosat 2012 (garnacha/monastrell, a little pinot noir) har all the charms of a sparkling rosé, but is also clearly in the family of aged Recaredo wines. Then there is Franciacorta, in the hills near Brescia in the Italian region of Lombardia. The only producer presented here was 1701, the first certified biodynamic producer in the area. They never use any dosage and sulphur only when absolutely necessary. As an ouverture there is the low-pressure (3 atmospheres) Sullerba, that is outside the appellation. It’s a light and lovely, yeasty and appley, super easy-to-drink wine. Made from chardonnay in steel and amphora with 12 months on its lees. Their Rosé is lovely, from the 2012 vintage (these wines are also officially NV), fresh with raspberry notes, and a good balance between the fruit and the aged qualities. The Satèn from the 2013 vintage is a chardonnay with 30 months on lees; fresh, not too complicated, but delicious drinking. Maybe the most “serious” (among these wines, all of them obviously serious) is the Vintage 2011 Dosaggio Zero, a 90% chardonnay, the rest pinot noir (pinot nero in Italian), 42 months on the lees, 20% in barrels. Here is a perfect balance between ageing and fruit character, with some toast, mature apples, and a balsamic touch. Long curve. 1701 was a nice surprise and a producer that I didn’t know before. Talking about fun: Prosecco is often marketed as such, but alas, like for many others the vast majority doesn’t give me much of that. But luckily Casa Belfi was in the house! 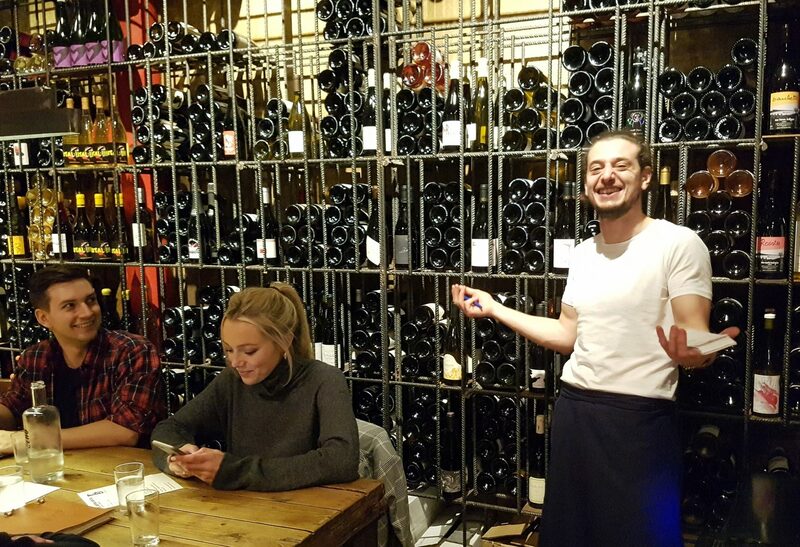 Casa Belfi (or: Albino Armani) works according to biodynamic principles and there is no fining or filtering involved, nor any addition of SO2. 6 months on lees is typical. I have tried all the wines before, and they are truly joyful wines to drink. I think especially the normal Colfòndo Frizzante 2015 has a good value, with its expressive, pure fruit. It’s yellow/orange, cloudy with a super and fresh apple and citrus peel aroma, notes of bread, and a dry finish. The Colfòndo Anfora 2015 is darker after 7 days of skin contact and 4 months in clay. It’s still fruity, with mature apples, a spicy touch and a citric aftertaste. Talking about fun, the red Raboso Frizzante 2015, from the grape variety by that name, has all the playful expressiveness you can ask for. Red with a dark rim; red berries, earthy notes, and lovely fruit all the way. Casa Coste Piane was also there. This is an estate that dispose of many old vines, some pre-phylloxera, and like Casa Belfi the second fermentation takes place in the bottle, dégorgement is not carried out, so some cloudiness is inevitable. At this point it has not the same expressive qualities as its neighbour, but has more subtle citrus and minerality, and it’s definitely promising. A couple of days before the fair I visited Will Davenport in his winery in Rotherfield, East Sussex (a short article will follow). Davenport Vineyards, or Limney Farm, is the biggest organic producer in the UK. The winery is small and modest, but it’s fully equipped to make both still and sparkling wines. Therefore they give services to other producers in the area. I love their still white Horsmonden White, but as this piece is about sparkling wines we shall take a brief stop at the Davenport Pet Nat (you know that wine that everybody makes nowadays that can do it, a welcome trend, in my opinion), aged 3 months before disgorging: Light in colour, very aromatic, mature apples, some citrus. Then there is the Limney Auxerrois Sparkling 2014, from a vineyard near the farm, 18 months on lees: Rich yeasty character, stony minerality, and a fresh and delicate touch too. And lastly the Limney Sparkling Rosé 2014: salmon pink, some autolysis character on the nose, plenty of fruit, raspberries and a citric touch. I was about to say that Forty Hall Vineyard makes the wines with the shortest travel, from Enfield, North London. It’s not quite true that it’s the one with shortest travel, because it has travelled down to Davenport’s winery in East Sussex, and back again, because Forty Hall is among the producers that get some help from Will Davenport. Forty Hall is a 4 hectar organic vineyard, the first commercial producer in London since the middle ages, led by volunteers as a non-profit organization to support the community. The London Sparkling Brut 2014 was delicious, beautifully balanced with lightly yeasty character, rounded fruit (mature apples and a touch of citrus) and just enough acidity to match. Apart from this there were some occational bubbles from producers that aren’t primarily makers of such, both fully and half sparkling wines from Loire, from Italy, and from elsewhere in the world. Stavanger Vinforum was established in 1995 to contribute to more interest in and better understanding of wine in the southwestern region of Norway. Their most important activity is the annual fair, and this was the 23rd in a row. Each year has a specific theme, usually one or more countries. This year Spain and Portugal was in focus. 17 importers presented a total of around 250 wines, and there are always seminars: This time one mainly about Rueda by Igniacio Pariente of Bodegas Pariente (formerly II Victorias), one by Óscar Alegre (of Telmo Rodríguez’ company) about the northwestern corner. I have written more about the fair itself for other publications. Here I will just present some of the highlights, from my own perspective and according to my own preferences. Spanish sparkling wines: We are talking mainly about cava here. A head above the rest on the fair is Gramona, this time represented by their superb xarel.lo-based III Lustros Gran Reserva, now in the 2007 vintage. This wine shows the greatness of the xarel.lo grape, not very aromatic from the start, but after some years it starts to shine, and in Xavier Gramona’s opinion the best grape for cavas meant for ageing. This one spent 7 years on lees, has great depth and concentration, aromas of toast with a smoky note, and still with an incredible “presence” after all these years. Reserva Millesime Brut Nature 2011 (Castelo de Pedregosa), mainly from pinot noir, was kept for 3 years on the lees. It’s quite concentrated too, with the characteristic “bakery” aromas. Clos Lentiscus, DO Penedès (not Cava) was new to me. Their Blanc de Noirs Brut Nature 2010 was a different take. The “noir” variety of the title is sumoll, that not many years ago was a nearly extinct grape, but is now on the rise. The colour is almost orange, or maybe pink-ish, from a somewhat extended skin-contact. It’s more robust and tannic than the fair’s other sparklers. To the white wines: Rueda is a region that is gaining still more ground in the conscousness of the people, but at the same time it’s facing problems with high production and many wines that are maybe correct, but with lack of personality and inspiration. I chose Basa 2015 (T. Rodríguez). It’s based on verdejo, but includes 10% of viura, and is sourced from various plots around the area. It’s a fresh, fruity wine for everyday drinking, and maybe a typical restaurant house wine. A very good one. Equally good and consistent is Gaba do Xil 2015, a Valdeorras wine from the same producer. Not so straightforwardly generous, but with more layers, and with those typical hints of straw and herbs from the godello grape. A single white wine represented the Canary Islands, Trenzado 2014 (Suertes del Marqués), a complex and rich skin-contact white that shows what can be done on Tenerife. This has been highlighted here. From the Gredos area (province of Madrid) it was a nice to taste the Navaherreros Blanco from producer Bernabeleva again, now in the 2015 vintage. This is a predominantly albillo real with some macabeo, with hints of white flowers, peaches, yellow apples and slightly buttery too (from fermentation in big vats and ageing on the lees), with good body and a smooth texture. From Catalunya I first tasted Espelt Quinze Roures 2015 from Empordà near the French border. This is a barrel and lees-aged wine from the grapes with the Catalan names lledoner roig (grey garnacha) and lledoner blanc (white garnacha), grown in slate and sandy soils with understated aromas, quite complex (dried fruits, anise), good body and concentration, a touch of skin-contact, and just enough acidity to match. From Torroja, Priorat, producer Terroir al Límit was represented by 8 wines, 3 of them white. 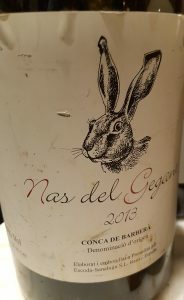 I especially liked the Terroir Històric 2015 (garnacha blanca 75%, macabeu 25%) aged in concrete eggs for 6 months, golden in colour with aromas of yellow apples, hints of honey, medium-bodied, and with a salty mineral aftertaste. The Terra da Cuques 2014 (pedro ximérez 80%, moscatel 20%) had more skin-contact feel, but was also fresher, with floral and citrusy notes, some herbs too. Quite rounded texture, expressive and with a touch of acidity. Dare I say elegant: For a Priorat very much so! Fortified wines and dessert wines were not among my priorities this time. But some good wines for later in the meal were chosen. Among these the Molino Real, now in its 2010 incarnation. Telmo Rodríguez makes this wine in cooperation with Bodegas Almijara of Cómpeta, Málaga province. It’s always good, some vintages more lemony than others. I have a suspicion that it’s lighter than before, but it’s a really nice moscatel, an old-fashioned “mountain wine” introduced at a time when wines from the pedro ximénez grape was reigning supreme in the area. Lastly, I know very well the sherries offered, so I didn’t taste them this time. But I never miss a chance to taste the wines selected (not produced) by Equipo Navazos. They chose single “botas” (barrels) of wines that they find exceptional. The one presented here was 57 – La Bota de Florpower MMXII (in other words: a sherry vintage 2012), a light, grapey fino with some citrus notes, and yes! with a lot of “flor” character (the layer of yeast that covers the lightest wines in the bodega). Simply delicious! On my way out I couldn’t miss a completely natural cider from the northern region Asturias, the Valdedios Natural (Manuel Bustos Amandi), with aromas of citrus, green apple, herbs, and with a slightly bitter aftertaste. This is a xarel.lo based gran reserva from one of the three superior cava houses (in my opinion at least, and if you ask me I will reveal who the others are). Anyway, this is a classic, or a legend, one of several from Xavier Gramona and his team.